The Parking Prankster has been made aware of a new FoI request showing the number of court claims won by ParkingEye. The Prankster freely admits he might be interpreting the figures incorrectly. ParkingEye can feel free to update him with the correct figures if he is wrong. Hearings marked with a 'J' are apparently judgements, but this can be 'Judgement for Claimant' or 'Judgement for Defendant'. The Prankster thinks 'Judgement for Defendant' will only happen if the defendant counter-claims. He doesn't know of any cases where this has happened, so has assigned all 'J's to ParkingEye wins. Hearings marked with an 'O' are apparently 'Claim Dismissed'. They may include other categories as well, but The Prankster does not know what these would be. He has therefore assigned all these to ParkingEye losses. 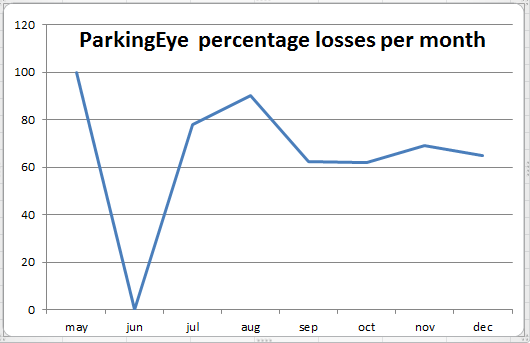 The Prankster has also attempted to match up known ParkingEye losses with the data. This was partially successful. In one case the claim was marked 'X' as not recorded yet, and in the Lemon and Harris case there appeared to only be one claim recorded instead of two. Based on these adjusted figures, The Prankster has come up with the following graph. The data behind this is as follows. ParkingEye's infamous claim that they win 90% of cases was only applicable in August. After that the percentage of cases won per month has hovered between 62% and 69%. This means ParkingEye win less than 2 cases for every 1 case won by the motorist. The Parking Prankster has seen transcripts of case won by ParkingEye and can quite understand why they won - the defence was poor or non-existent. If you are defending a ParkingEye claim and they quote cases they won, you should immediately ask them for all transcripts quoted. These will provide you with a good lesson on how not to conduct your case at court. To win a case the Prankster recommends you look at winning transcripts, at the winning legal arguments and that you know your facts when it comes to the hearing. Take a friend with you if this will help. so out of the 1000's of claims issued last year, only 284 have got near a court room so far? And only 101 have resulted in a judgement in PE's favor. How many of the settled before hearing were withdrawn without payment like we have seen in many cases on Pepipoo and MSE? How much did Capita pay for this shambles? If I were a shareholder I'd be asking some difficult questions at their May AGM. The real shocking thing is that out of the 1000s of court claim issued only 284 have gone to a hearing. This means that nearly all court claims issued will have been paid immediately by the motorists... so PE's idea of using the court system as the next stage in debt recovery goes pretty well, and I think this whole discussion about how great it is to win a few cases misses the point. The more one delve's, the more one worries. I was of the opinion that a robust legal system was one which kept you out of court, it seems like this is questionable. Another court spanking for PE, get in there!